A 28-year-old woman who had 60 percent of her lung removed is giving Zeddie Little, better known as " ridiculously photogenic guy," a run for his money. The woman, known only as Rachel, was nicknamed "ridiculously photogenic surgery girl" after posting photos from her hospital bed on Reddit. "I'm currently in the ICU of the Cleveland Clinic," she wrote. "My pain is being reasonably managed, but I cannot fall asleep. Anyone care to entertain me?" Judging by the response, the answer was yes. 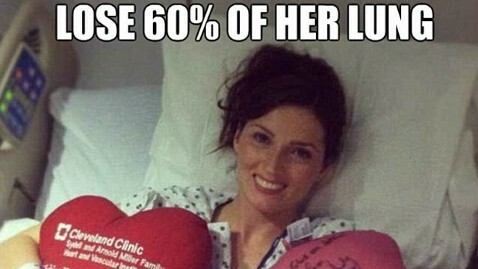 The post amassed 612 comments in 11 days, many about her beauty, and spurred the Internet meme, "Lose 60% of her lung … wins 100% of my heart." Rachel, an Army wife and mother from Dayton, Ohio, said she has congenital emphysema, a lung disease she's had since birth that became problematic after she contracted pneumonia. "I've had it my entire life and didn't know," she wrote. The genetic form of emphysema is caused by a deficiency in alpha-1 antitrypsin, a protein that helps give lungs their elasticity. Rachel said 60 percent of her right lung was damaged. "I begged my surgeon to let me see it when he got it out," she wrote. "He took pics, though, and I will get to see them today. Anyone want to check them out after I get them??" Rachel said even she was surprised by how great she felt - and looked - just hours after major surgery. "I am just as surprised as everyone else that I managed to look like that," she wrote. "I know exactly what it is, too. It was taken when I was still on so many pain meds that I couldn't feel anything but happiness!" When the painkillers wore off, it was a different picture, she said. "My incisions and tubes and lungs were on fire. I wanted to scream but moving and making noise made it worse," she wrote. "I can assure you that happy glow isn't there today!" But the flood of comments like, "Damn, I wish I had looked this good after my surgeries," and "You are beautiful! Good luck with the recovery," may give Rachel the boost she needs to power through the pain. "WOW!!!! I can't believe how many people responded to my little post!!! I was thinking 25-50. My mind has been blown!" she wrote. "It is going to take awhile to respond to all of this, but I'm really touched that so many people cared enough to say anything at all."